‘T’ minus two days and counting!…..that is tip my first afternoon at the New Brunswick College of Craft and Design (NBCCD). In preparation, I have been making a list and checking it twice of what I need to take with me. 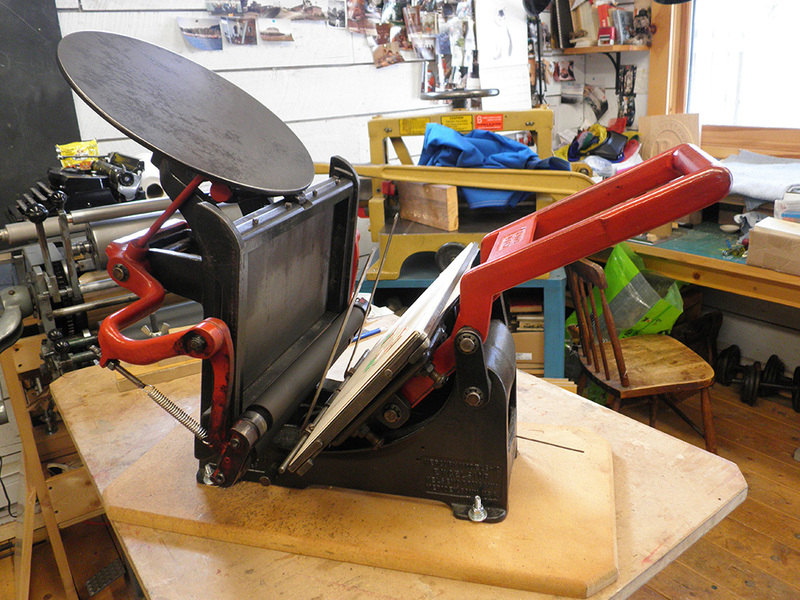 The list includes the above little table-top Kelsey 6 x 10 press. I dug it out from under its little blue dust cover, made by my buddy Rik Hall. It needs a little oil here and there at the appropriate places (basically anywhere that metal moves against metal), but other than that, it is ready for me to load into the van and take to the college where it will live for the next couple of weeks. It’s a bit of a lift and a lug for one person, but I’m sure of some more or less able bodied students down there to help. The plan is that Mike Cote’s(little accent acute over the ‘e’) History of Typography class will do a little linocut and print it on the Kelsey. A kind of old-style-take-a-trip-and-never-leave-the-farm-field-trip for them. Then, after the March Break, they get to leave the ‘farm’ and come over to my place….but that’s a ways away yet and something else again. For right now, getting ready for Day 1 is enough for me……and for poor Gerty, too, who has a bad case of cabin fever after a long winter in the studio….